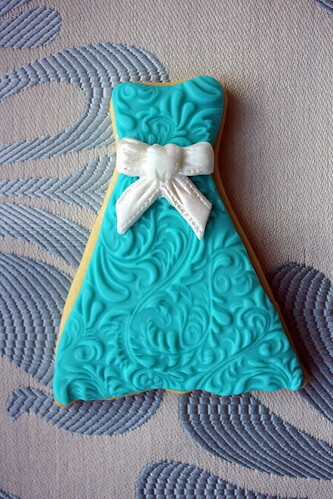 You may remember these dress cookies that I showed you recently, that I decorated using a stencil. I think they need a little something extra but I am not quite sure what yet? Roll out the fondant to about 5mm. Rub a small about of vegetable fat on to the fondant to stop in from sticking. Emboss the pattern onto the fondant using the end of a rolling pin and a circular motion.Alternately use the method from the Autumn Carpenter site. Cut out the fondant using the cutter, then gently life and stick to the cookie, use some ping gel or edible glue if you have it, if not a bit of water normally does the job well enough. If you use the three texture mats that come with the kit, these are the embossed dresses that you will have. Other than the one on the left, which is always my favourite, they don't look much at this stage and need a little extra embellishment. For the dress on the right, I used an edible paint pen to paint over the flowers and the swirls. 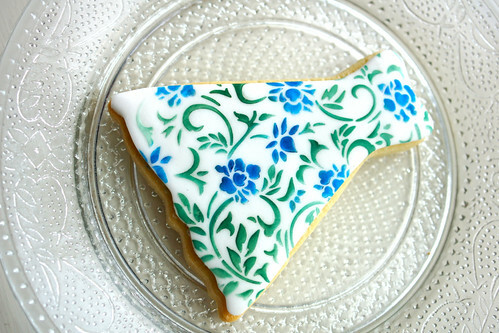 This was an absolute disaster, the pen just flattened and tore at the fondant and the silver colour I was using did not show up, this went straight into my families "eat me" biscuit tin. 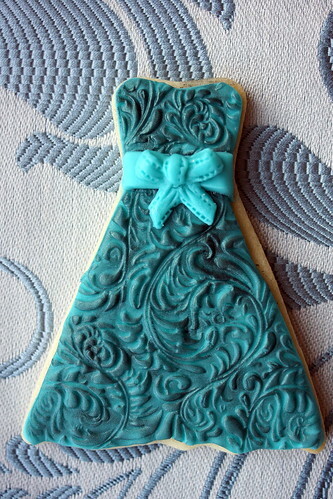 The the dress on the left, I added a bow that I had dusted with a white lustre powder. Then finally I added some lustre brushed daisies to another dress and here they all are together. Maybe the daisies are my favourite?